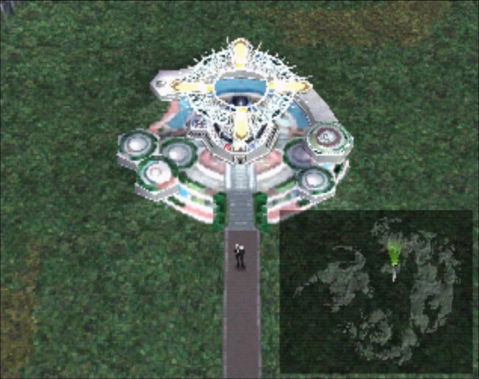 You'll begin the game in Balamb Garden. You're free to explore, but there isn't much you actually have to do here early on. Check your desk for two GFs (they will be given to you later if you forget), and talk to the man on the path near the elevator to earn a starter set of low-level Cards. The directory in the main hall allows you to quickly travel to the outer parts of Balamb Garden. There's a lot to find in these areas, and there are enemies in the training center. When you return here on disc 2, there will be fighting and confusion in the Garden. Enemies will attack anywhere, and the save point near the directory is missing. (This is especially annoying since when you arrive you won't have had a chance to save since the last boss fight.) You can't use the directory to warp at this point, either. The easiest save point to reach is in Squall's dormitory room. To proceed, you'll have to visit every offshoot of the main Garden floor. In most cases you'll fight a battle with normal enemies. Your answers here don't matter—the game won't let you side with the Garden Master. In the two cases where you can choose whether to help SeeDs, not doing so will result in skipping the battle (you'll also miss out on a Remedy by skipping the T-Rexaur battle in the training center). Once you've done everything, return to the entrance, where you'll find Xu near the elevator. Follow her to the second floor, and she'll lead you to Cid. He will in turn send you to the MD level. This level is fairly straightforward, though there are a few minigames required to proceed. You'll eventually fight a pair of Oilboyles with an exploitable weakness against Fire. After this fight and some dramatic cutscenes, you'll have a chance to rest up and save. Rinoa will ask for a tour of the Garden. When you reach the entrance area, a Garden Faculty member will direct you to the Master's Room on floor B1. At first you'll fight the NORG POD. The Left and Right Orbs begin blue, but will turn yellow, then red. When red, they will cast magic on the party, but an attack will send them back one color. Keeping them blue or yellow will stifle NORG's offense. Once the NORG POD is destroyed, you can target NORG directly. Leviathan can be Drawn from NORG at this point. Afterwards, you'll want to speak to Cid in the infirmary. Head back to the directory where you'll run into Xu. Head to the second floor observation deck to see the ship she mentions. They will be looking for Ellone, who can be found in the library. After a series of events and cutscenes, the now-mobile Garden will arrive in Fishermans Horizon. Several cutscenes later, you will be able to pilot Balamb Garden as a vehicle, but you will not be able to use Selphie for the moment. With control of Garden, you can explore much of the world now (although not Trabia Garden), although your immediate destination is Balamb. After you find Edea's House, you will enter into a battle with the mobile Galbadia Garden. The battle starts with Squall giving orders. The specifics don't really matter, though a good leader will keep it simple. The results of giving bad orders are pretty amusing, though. Important orders you don't make (preparing attack and defenses, protecting junior classmen) will be made regardless. To begin, you'll have to form a squad that doesn't include Zell or Rinoa. Those two and the member you don't choose will make up Zell's team. Your initial job is to head for the Quad. Feel free to give orders to any stragglers you meet on the second floor—one of them will give you a Cottage. Once you get to the Quad, it's right back to the bridge. After a cutscene, you'll be controlling Zell's team, though you'll lose Rinoa pretty quickly. Run back to the front gate when this happens, and Squall will choose a new group (still not including Zell or Rinoa) and head for the classroom on the second floor. You'll fight a quartet of Paratroopers before being called back to the bridge. Squall will return to the second floor alone. Head for the second floor deck to find a lost child. You will be challenged by a Paratrooper—look around for another option and press the emergency exit to start an interesting midair fight. Your punch is slow but powerful, and should only be used after a block. Kicks are fast and can counter enemy punches, but don't do much damage. Blocking repeatedly will enable the Deathblow option, which is your best route to victory. If you fail, you can try again freely, so don't worry too much. After this sequence, the battle continues in Galbadia Garden. On disc 3, you will be able to play the CC Group in Cards. There are 7 CC group members, and you'll need to beat each before you can challenge the next one up the list. You must also win a number of games in Balamb Garden before you can even challenge Jack. Jack is located near the entrance, and will mention the CC Group (but not that he is a member) until you have the reputation required to challenge him. Next up is Club, who randomly appears in the central hall near the cafeteria entrance. Third on the list is Diamond, a pair of twin girls found near the directory. Fourth is Spade, who is located outside the second floor elevator. Once you've beaten Spade, things start to get interesting. The fifth member, Heart, is actually Xu. You can play her on the bridge and win the first rare Card any CC Group member has from her, Carbuncle. Joker is the "Man from Garden" Shop guy in the training center, and has Leviathan. To play King, challenge Dr. Kadowaki, then go to your dorm room. King, who has Gilgamesh, will show up. Aside from Joker, who will be present regardless, any CC Group members you beat will be present on the Ragnarok in Disc 4. All Card players have access to all rare Cards in disc 4, but having multiple CC Group members available to play is useful because they each use rules from a different region.